Saturday was a fun filled day on my second most favourite street in Hamilton. 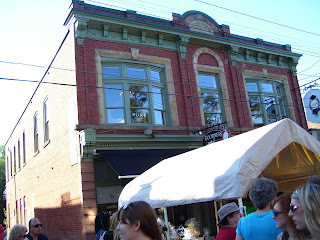 It was the twelfth annual Locke Street Festival. I love the beautiful, old buildings and unique shops, bakery and restaurants at any time of the year but the festival is a special treat. The street is closed to traffic, kids bouncy tents set up, store owners bring their wares outside offering special prices and extra vendors set up tents full of treats. And, of course, there was shopping! Here are the treasures I found! I discovered Nature's Beauty by Denique. Her line of 100% natural, hand made skin potions are very reasonably priced. I bought the Unscented Body Butter, a Shea butter base skin cream that is wonderful! It's nicely packaged but I have to repackage everything. It think it looks lovely in this antique dressing table jar. She gave me a sample of African Black Soap to take home and it's like washing in lotion! This lovely lady has an Etsy shop and you can order online or get local delivery. Check out her website and be impressed with the pricing! The antique vendors had more treasures and they were bargains! The authentic grain sack, all the rage in decorating, is in excellent condition. The Girl Scout laundry bag is like new. I bought the pair for $15.00! The beautiful Irish Ceramics and Crafts Co. bowl was a mere $10.00 and the Fitz and Floyd shell bowl was $9.00. You can find these vendors at the Freelton Antique Mall. I did a little birthday shopping for my granddaughter's first birthday at Citizen.Kid. I love their Eco friendly, fair trade policies. I also love that their toys are not made by someone else's grandchildren and covered in lead laced paint. The best part of the day was completely unexpected. At the end of the street is a tiny shop named Florence Dwelling. They do readings, Reiki, crystal healing, past life regressions and so on. On a whim, I asked if someone was doing readings that day. They could just squeeze my sister and I in. The rules were strict - one question, one answer, ten minutes, $10.00. I've never had any luck with psychics. If they couldn't get anything about my present life right, I didn't have much faith they could see my future. But, $10.00 isn't much of a gamble. T. K. Atkinson did my reading and she got it all right! I never even asked my question! Since she knew what I wanted to ask, knew my past and knew my present, I'm going to believe she is right when she said my future is going to be great! It's been a bit scary working less and living more and I haven't been exactly sure my new endeavours will be successful. 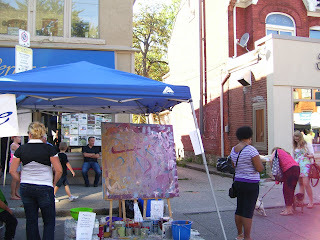 I felt a lot more comfortable as I left Locke Street and that is great value for $10.00! Non festival rates are $40.00 for 1/2 hour and you can contact them at 289-230-0160. It's more than worth it! So for my weekend, shopping = socializing = new friends = feeling contented. That's because It's All Connected! Silver, Linens And Crystal Make Me Swoon! The Sequel to Attack Of The Killer Tomatoes. Hail To Vodka And Bourbon! Please Don't Leave Me Summer! Make The Ordinary Something Extraordinary! I love Shopping For Home Decor!! !